Pedestrians pass by a view of Portland Harbor on Fore Street in Portland on Monday. 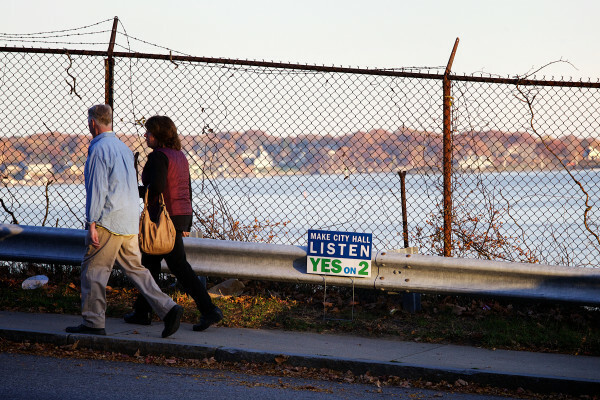 PORTLAND, Maine — Voters turned down a referendum to catalog the city’s scenic viewpoints and put those areas under stricter zoning requirements, siding with opponents who said the measure would hamper development and slow any addition of affordable housing in the city. Supporters of the new zoning rules in the local Question 2 focused particularly on the eastern waterfront development at 58 Fore St., where some neighbors were dissatisfied by the planning board process and concerned about new buildings that would block their waterfront views. Anne Rand, spokesperson for the Save the Soul of Portland group supporting the referendum, said she was disappointed by the results Tuesday. “The developers have said this is going to be a 10- to 15-year buildout, and we intend to be there every step of the way,” Rand said. The ordinance would have created a 13-member task force to catalog such scenic viewpoints in the city, which would then be subject to the stricter zoning standards and possibility of petitions from affected neighbors. Opponents organized a broad coalition ranging from developers to advocates for the homeless and elderly and labor groups, who argued the ordinance was too broad and would hamstring new projects. That opposition group, called Portland’s Future, also far outspent supporters of the ordinance, raising a total of $121,971 through its political action committee, as of the latest campaign finance reporting deadline. That amount included $20,000 in contributions late in the campaign from CPB2, the redeveloper of the Portland Co. Complex at 58 Fore St.
David Farmer, a spokesman for Portland’s Future, said that spending was required to inform voters about the proposal. “Elections are all about providing voters with information, and in an election on an issue that on its face sounds appealing it was critical that we talk to voters and encourage them to read the ordinance for themselves,” Farmer said. The opposition also benefited from $21,000 raised by the Maine Media Collective, which publishes Old Port Magazine and used the money to increase distribution for an issue that advocated a No vote on the question. Soul of Portland raised $27,215 through the latest period and also had about $3,730 in in-kind contributions. Rand said that funding disparity made the race difficult, but she said the results of the vote total made clear the will of the voters. Soul of Portland made impassioned pleas that new developments threatened the character of the changing city, tapping into topics from a heated local referendum last year over the sale of the public Congress Square Park in the heart of downtown. Both campaigns dealt with concerns broadly cited in citywide elections over the city’s affordability and the pace and nature of development on the city’s peninsula, with an eye toward preserving Portland’s character. Incumbent Mayor Michael Brennan and challenger Ethan Strimling opposed the new zoning rules. Challenger Tom MacMillan supported it, saying it would protect public views from private development.